Thomas Lanigan-Schmidt, The Gilded Summer Palace of Czarina Tatlina, 1969–70/2012, mixed media, dimensions variable. Pick any single work by Thomas Lanigan-Schmidt, and chances are it glows. 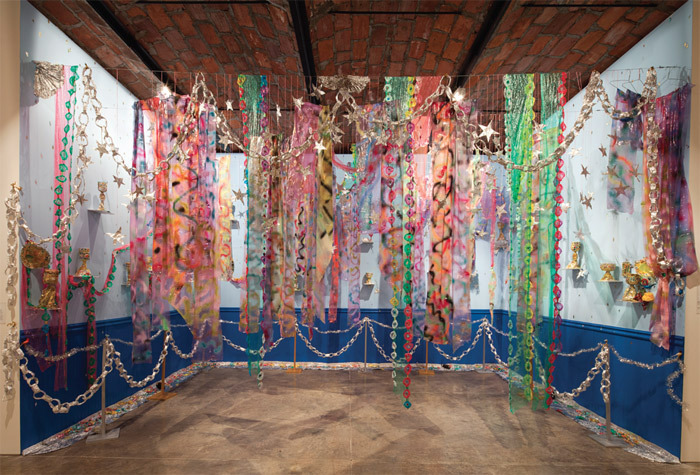 Or sparkles, or shimmers, or, at the very least, reflects light, thanks to some medley of the glitter, foil, theatrical gel, tinsel, cellophane, neon tape, floor shine, and vinyl with which the artist forges collages, sculptural objects, and installations. The effect of encountering 160 such works, packed in vitrines and jamming the walls and columns of a single gallery at MoMA PS1, was quite literally dazzling; the lights were dim, one imagined, since the art was coruscating enough on its own. And because many of the objects are religious in form and theme, a mood approaching reverence ensued. Even the rats, figured in a few small sculptures here and there, were studded with rhinestones.